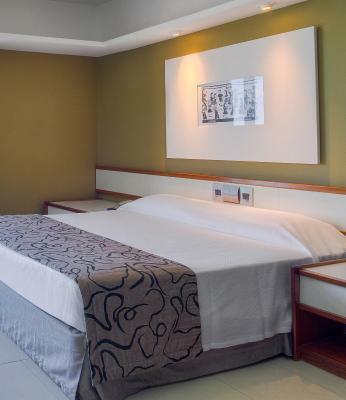 Lock in a great price for Grand Mercure Recife Boa Viagem – rated 8.3 by recent guests! 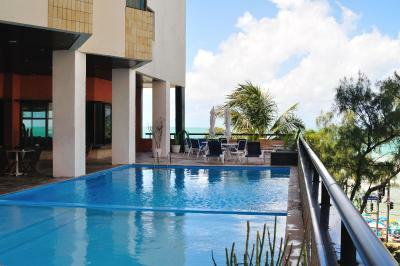 The hotel has a good location near to the Boa viagem beach. And that’s it. Excellent location and very safe place. Clean rooms, quiet rooms and all team always able to support you. The hotel room was well decorated and comfortable. There were amazing views out towards Boa Viagem beach, even from a lower floor. Breakfast was fantastic with plenty of options for people with special dietary requirements. Spacious room with great views out to the sea. Good restaurant. Large and comfortable room, great location. Good breakfast. Nice and quick room service. Good value for money. The check in process was wonderful! The front desk agent was knowledgeable, courteous and very patient. The room was big and had a beautiful view to the beach. This was our second stay at this hotel, and it was wonderful as the first time. Excellent breakfast, excellent hotel bed, amazing ocean view... everything was very clean, and staff helpful. The location was perfect to go to Shopping Mall Recife where you can find all kinds of different shops and restaurants, and we enjoyed a nice walk on the beach, with plenty of juice/coffee bars on the way. The breakfast at this hotel is excellent - a great variety of Brazilian specialities, fruits.... The hotel bed is very very comfy, you can expect a good night sleep, and the amazing ocean view from our room was incredible! Everything is very clean, and toiletries in the bathroom are very much appreciated. Hotel staff is very friendly and helpful, they speak fluent English. The location is close to the airport and Shopping Mall Recife where you can find all kinds of different shops and restaurants. The hotel is well known to the taxi drivers. 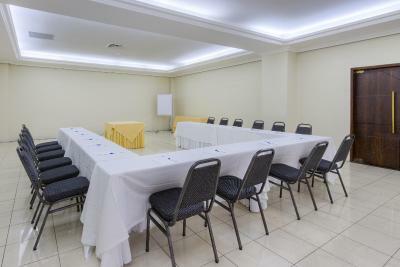 Grand Mercure Recife Boa Viagem This rating is a reflection of how the property compares to the industry standard when it comes to price, facilities and services available. It's based on a self-evaluation by the property. Use this rating to help choose your stay! One of our top picks in Recife.Ideally located right in front of the famous Boa Viagem Beach, within walking distance from various shopping and entertainment options, Grand Mercure Recife Boa Viagem features an outdoor swimming pool and offers free WiFi throughout and private parking. 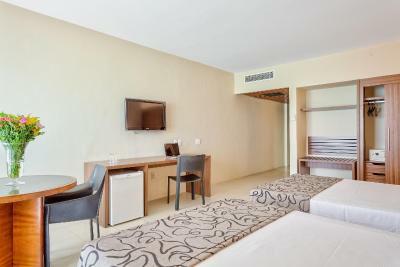 Tastefully decorated with pastel tones, the air-conditioned rooms at Grand Mercure Recife feature a flat-screen TV with cable channels, a desk, a mini-bar and a safe. The private bathroom includes a shower, free toiletries and a hairdryer. Some rooms boast scenic sea views, while others offer a seating area. 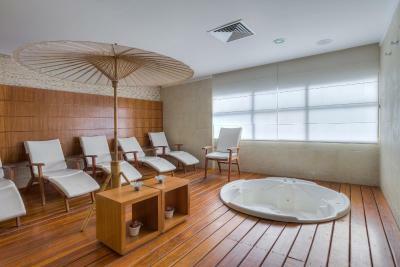 Guests can relax in the sauna, enjoy a drink at the on-site bar or have a meal at the Mangabeiras Restaurant. Spa and beauty services can also be provided. 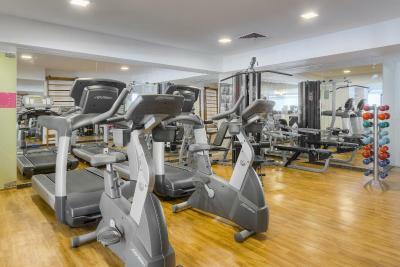 An equipped fitness center is available for guests who enjoy working out. Fresh fruits, breads and cold meats are served on the breakfast buffet every morning in the restaurant. Tea, coffee cold drinks are also available, as well as dietary options like gluten-free bread, lactose-free milk and detox juice. Other facilities at the hotel include a 24-hour front desk and meeting facilities. Recife-Guararapes International Airport can be reached within a 5-minute drive, while the popular handcraft market and the Recife Shopping Center are a 10-minute walk away. 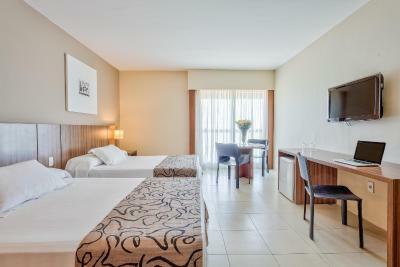 When would you like to stay at Grand Mercure Recife Boa Viagem? 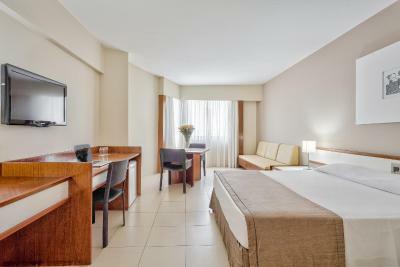 This air-conditioned room features a mini-bar, a safe and a flat-screen TV with cable channels. The private bathroom includes a shower, a hairdryer and free toiletries. 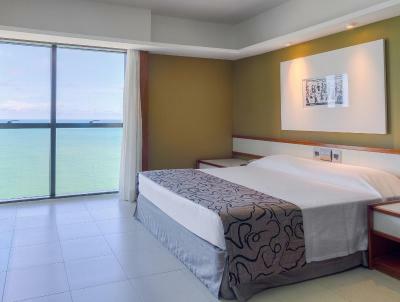 Boasting sea views, this room features air conditioning, a flat-screen TV with cable channels, a mini-bar and a telephone. The private bathroom includes a shower, free toiletries and a hairdryer. Boasting sea views, this air-conditioned room features a seating area with a flat-screen TV with cable channels, a safe and a mini-bar. The private bathroom is fitted with a shower, free toiletries and a hairdryer. Hotel surroundings – This neighborhood is a great choice for travelers interested in business, relaxation and nature – Check location Excellent location – show map Guests loved walking around the neighborhood! House Rules Grand Mercure Recife Boa Viagem takes special requests – add in the next step! Grand Mercure Recife Boa Viagem accepts these cards and reserves the right to temporarily hold an amount prior to arrival. Please note that this hotel is going through a brand transition to Grand Mercure. Please inform Grand Mercure Recife Boa Viagem of your expected arrival time in advance. You can use the Special Requests box when booking, or contact the property directly using the contact details in your confirmation. The hotel is very old. The elevator smells bad also the lobby of the hotel. I found a lot of hair in my bathroom, it was disgusting. My bedroom was in the 13th floor but I could listen all the horns in the street. Bad bad experience. Noise at night due to windows vibrating in winds. The furniture is a bit old and dated and the rooms need a refurbish. The pool and surrounding area could definitely do with an upgrade. Dated and a little dirty. Breakfast is outstanding. The view from my window was also fantastic. You can hear the waves at night. Lovely! Pleasing staff. Clean room. Good location. Rooms were very very ikd and dated, specially the bathroom. Windows are not double glassed so very noisy outside plus they are also old and one was quite loose so with the wind it was banging the all night. Didn’t sleep at all from 2am. Breakfast was ok but very busy and there wasn’t many staff to get things sorted quick. It wasn’t a good experience. A lot of people in the elevator, and during the breakfast. We loved the breakfast!! Awesome!